Mother Nature has blessed us with a heat wave for the last days of summer. Feeling anxious about all the changes coming in our life in the next couple months (Tristan starting preschool, the arrival of baby #2) I have felt compelled to squeeze every last drop out of the summer. In the last week, we’ve been to the swimming pool three times and the beach twice. 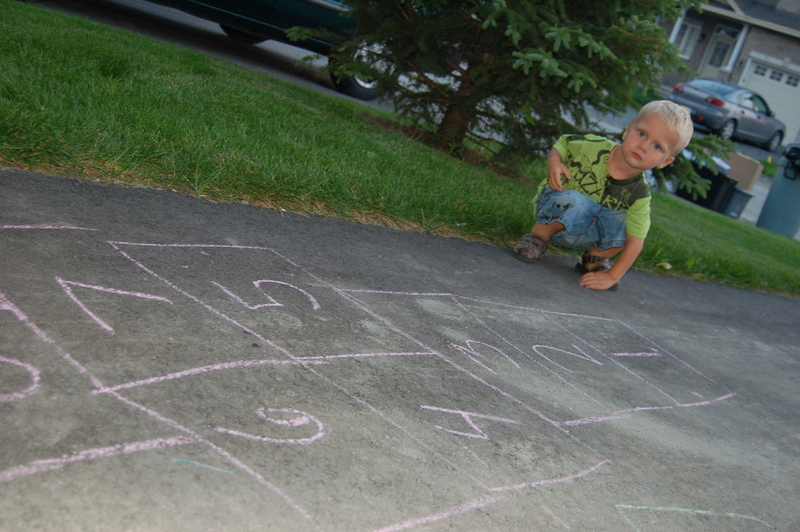 We’ve enjoyed the shade of our front yard whilst drawing sharks with sidewalk chalk, and I introduced Tristan to the wonder that is hopscotch. 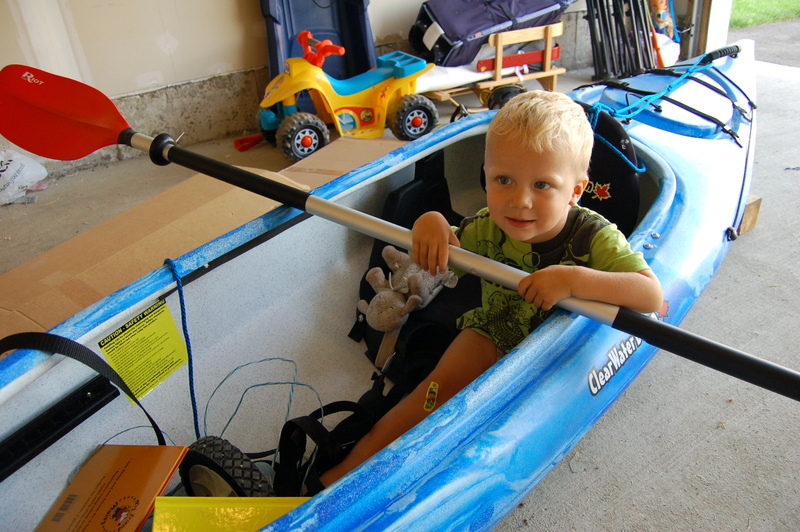 We went “kayaking” in the garage (since I’m far too pregnant to lug the boat to the river alone!) and we “camped” in the yard. And the best part of the hot weather? The ice cream. With a Baskin Robbins a quick one kilometre walk from our house, we’ve absolutely used this heat as an excuse to indulge. Ice cream is by far Tristan’s most favourite treat. 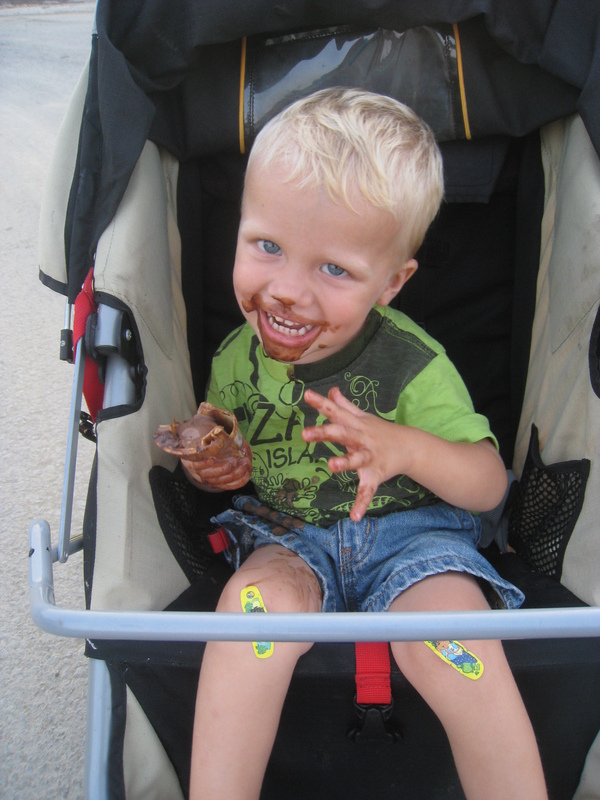 Any time, anywhere, the kid will happily lap up the cold, sticky goodness. Tonight he took his love of the confection to a whole new level. After wiping copious amounts of residue off of him, we noticed that he still had a dribble on his elbow. 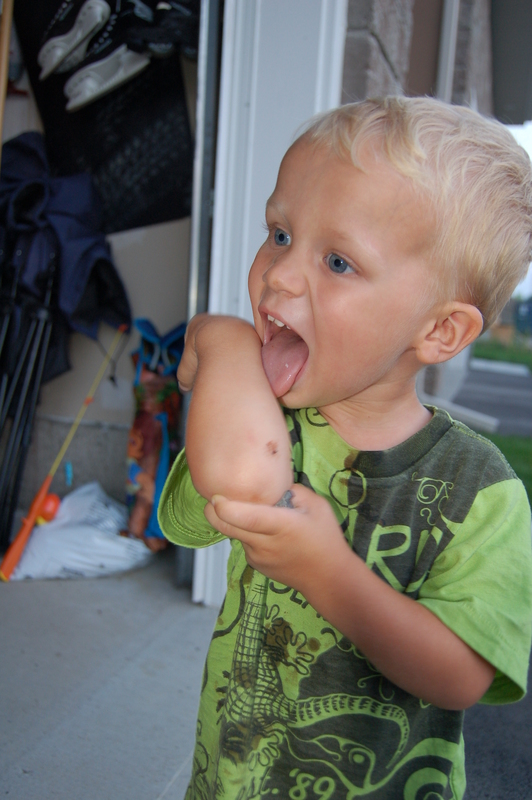 Not wanting to waste a single drop, Tristan attempted to lick the remainder off of his elbow! But I digress. As one of the strategies we tried to help us all get a little more zzzzz’s, we purchased the sleep sheep. A cute and cuddly little lamb that played soothing sounds such as ocean waves or a rain storm. The sounds may have helped marginally but what it has done for sure is given my little man the most comforting little friend. 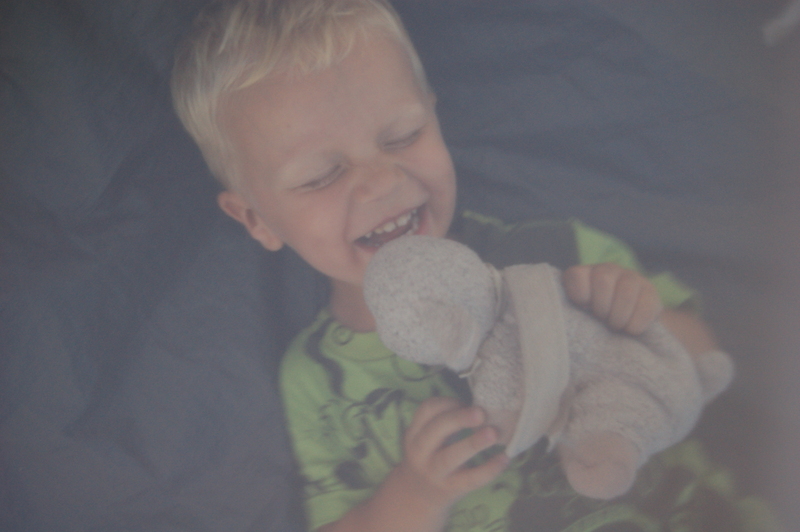 The sound box has long been tossed aside, but Baa Baa is faithfully at Tristan’s side. Despite regular washes, it’s limp body, which was once snowy white and soft, is now a dull grey matted pile of plush. I would never volunteer this lovey up for scientific bacteria testing. I don’t even want to know. 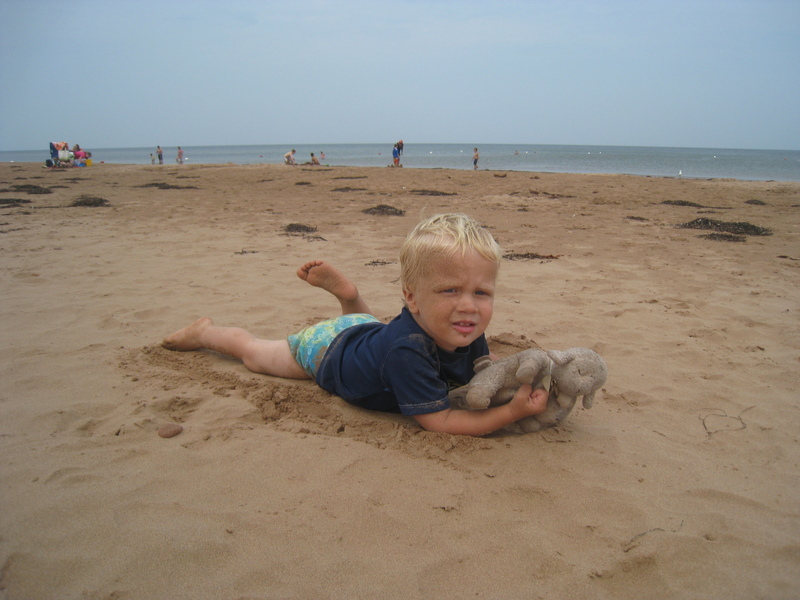 During our recent trip out East, Tristan held tightly onto Baa Baa wherever we went. The park. The restaurant. The beach. The stores. Oh, the stores. This is where our story rides a fine line between life happily going on status quo, and my little man’s world becoming an utter disaster. We stopped in Moncton to try out the famous ‘Magnetic Hill.’ Seeing as the actual hill was literally a one minute detour from our drive, we decided to stretch our legs wandering through the touristy shops and feeding the ducks. It was soon time to get back in the car for our last stretch of driving. 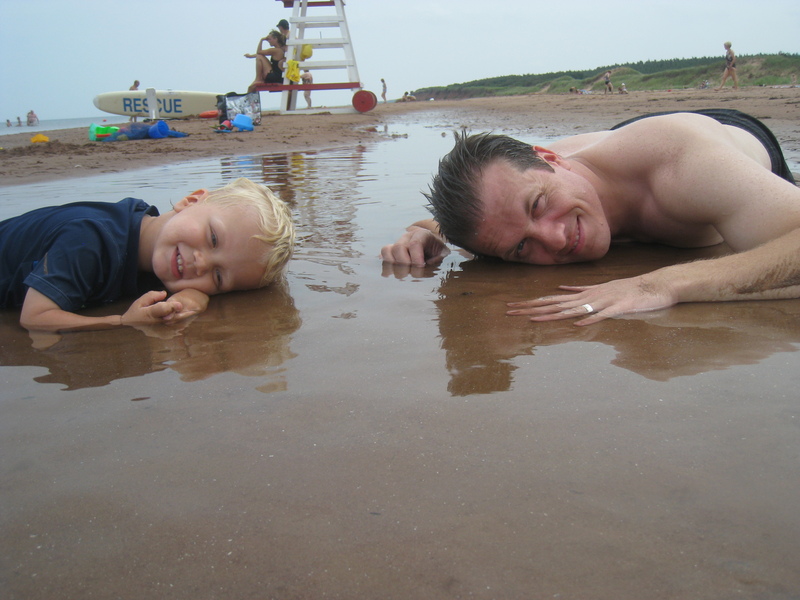 A few more hours and we would be able to relax at our cottage in PEI. It would be smooth sailing the rest of the way. Or so we thought. Tristan happily hopped back into the car, eager to get the DVD player going again. We headed off down the highway, dreaming of the beach that was to come. After a while, Tristan asked for Baa Baa. He had been faithfully on his lap for the duration of this trip so I was surprised to turn around and find him conspicuously absent. I started rooting through piles of luggage in the backseat, hoping against hope that he had just slipped down and was being covered by a random jacket or DVD case. 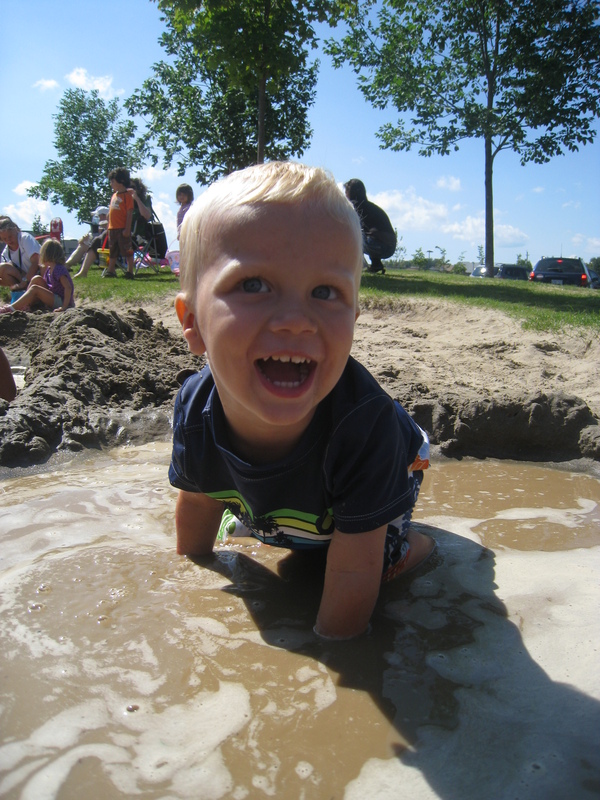 When I didn’t find him in the first 30 seconds, my gut told me what Tristan’s little heart did not want to know…. we had left Baa Baa behind. How far do you drive your son to reclaim the love of his life? Had he the life experience, he may even argue that Baa Baa was a piece of his soul. Thank God we had only driven 20 minutes out of Moncton and had not arrived at our final destination before this oversight had been discovered. When we arrived back to Magnetic Hill, I quickly hopped out of the car and jogged, as fast as my pregnant little legs would carry me, back into the store where we last remembered seeing Baa Baa. Please God, let that freakin’ sheep still be there. And he was! There, resting up on top of a pile of rubber lobsters, was dingy old Baa Baa. I headed back to the car, seeing Luc standing outside Tristan’s door trying to keep the little guy calm. A look of sheer relief washed over his face when he saw me coming with precious cargo in my hands. Thankfully, this story has a happy ending. 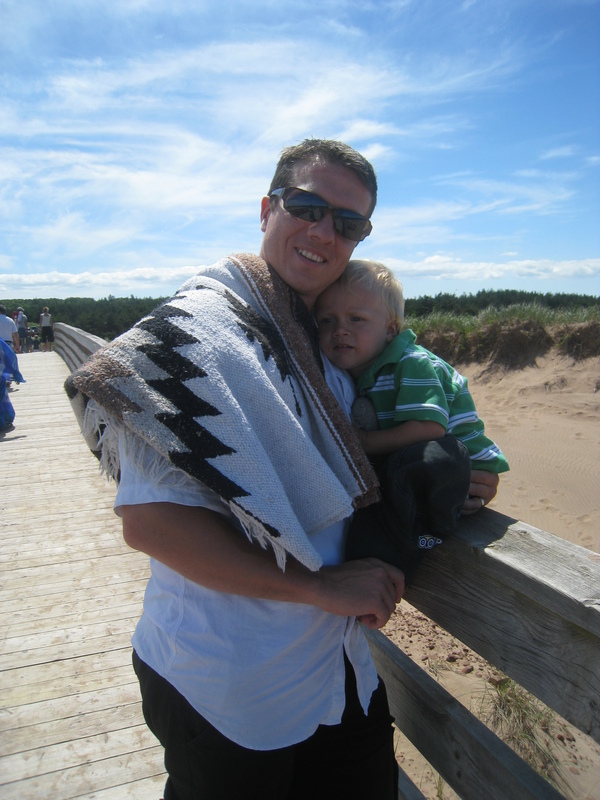 Tristan hugged Baa Baa tightly against him and we headed off on the road again. And we never again took our eyes off that darn sheep! We just arrived back from a 10 day road trip which brought us through Quebec and New Brunswick, to a modest little cottage we rented on PEI. We had an amazing trip spending time as a family, stuffing ourselves full of delicious seafood and splashing in the frosty Atlantic. One of the best parts for me was watching my two boys spend some real quality time together. As a stay at home mom since Tristan was born, it’s often been the “mommy-and-Tristan show.” I am the one who gets to enjoy all the small little moments and accomplishments of the day. I have been there through thick and thin (or messy crafts and bonked heads, as the case may be), so the little guy has definitely come to develop a lot more separation anxiety when it comes to mommy. 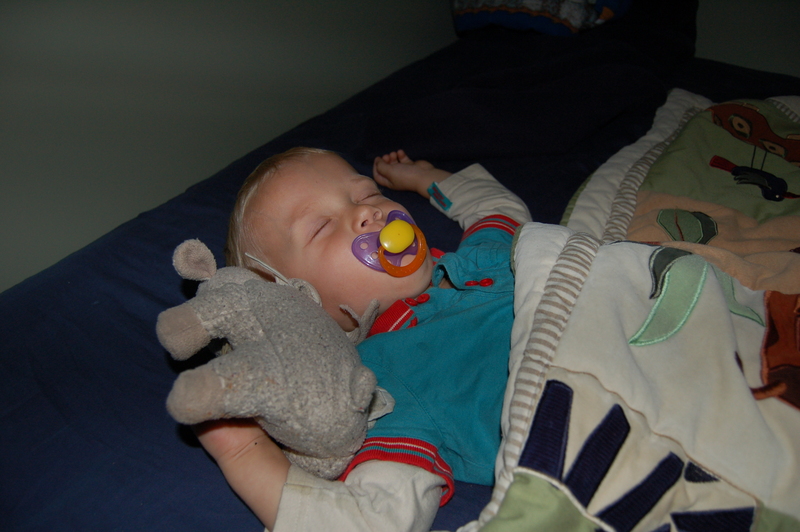 As the breadwinner of the family, Luc usually gets the leftovers of our day, and after a long day of playing and learning and being two, that last hour before bedtime is not always Tristan’s best hour of the day. 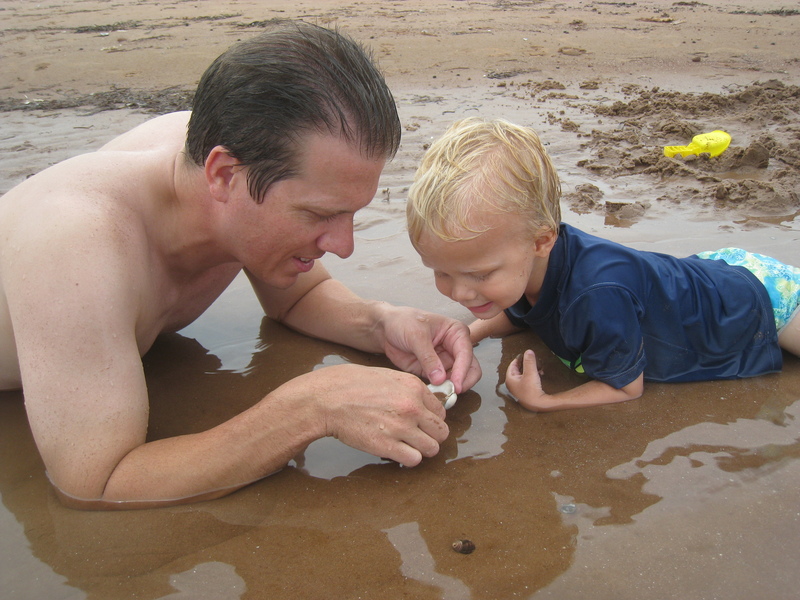 With 10 days of nothing but sand and surf and a whole lot of snacks, Luc and Tristan had plenty of time to snuggle and be silly and search for bizarre worms in the sand. It was really great for me to watch them bond over an ice cream or to play dinosaurs on the floor. 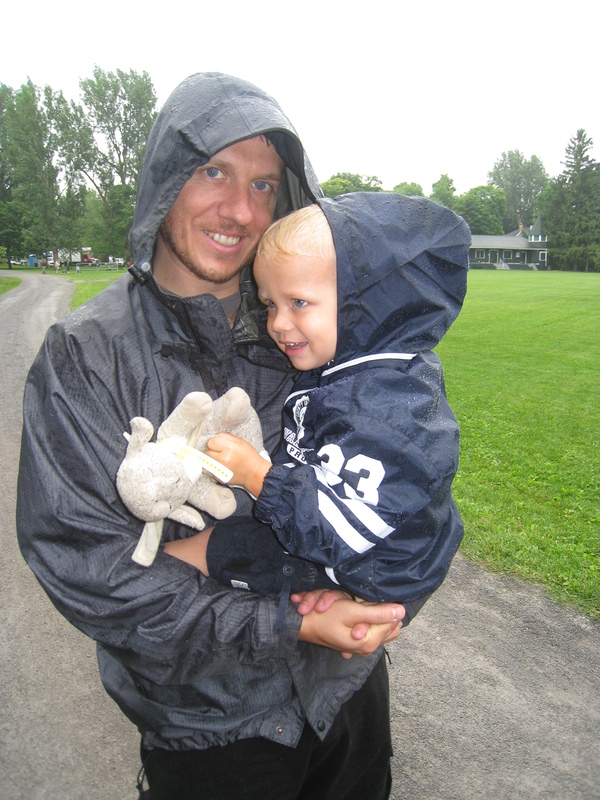 Luc is a really great daddy and I am happy that he got so much time to really soak up the role. Luc was lucky to spend so much time with such a great, funny and intelligent little boy, and Tristan was long overdue to hang out so much with his daddy. As the saying goes, any man can be a father, but it takes a special man to be a dad. Luc is that special man, which makes Tristan (and his mommy!) some very happy people. 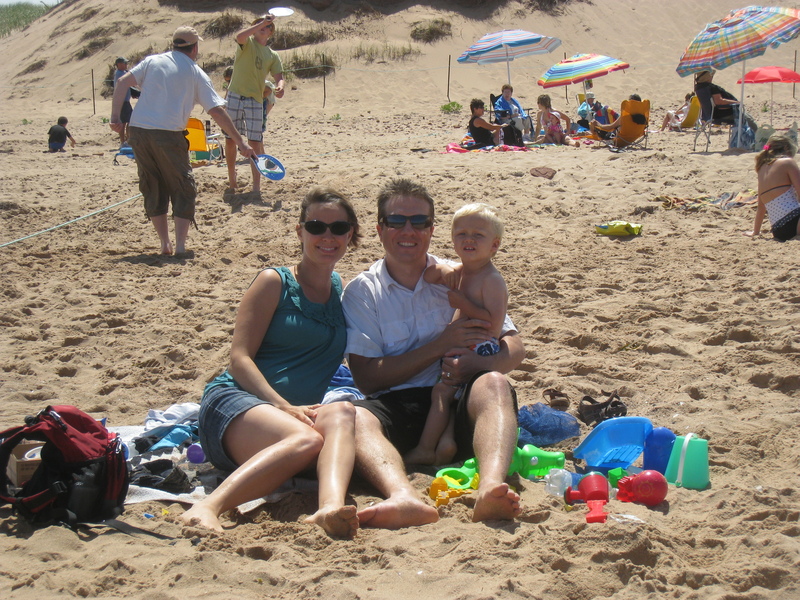 You are currently browsing the A Mom Like Me blog archives for August, 2010.